Going out and having Malaysia passport photos taken can be a real hassle. Of course, passport photos are a necessity if you're traveling abroad, so making sure they're ready is an essential step. Wouldn't it be nice to have them taken care of in a faster, easier manner? 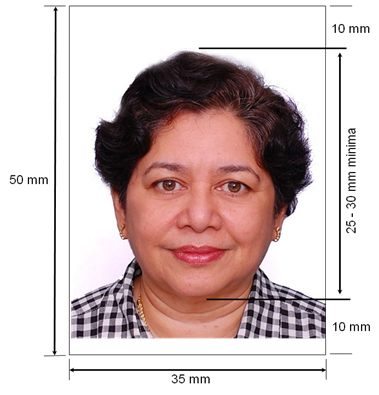 My Passport Photos is proud to offer quick options for obtaining your Malaysia Passport photos. Using our Quick Facts tips below, send a suitable photo of yourself, then let our skilled team handle the rest. Be sure to also go to www.ivisa.com. Their site will let you know if you require a visa and how to apply. The size of the picture is very specific. It needs to be exactly 35mm wide and 50 mm in length. Your head should fill 50-60% of the entire picture. There needs to be a 10 mm gap between the top of your head and the top of the picture. Same from chin to bottom of photo. In order to properly identify you, the image must reflect your true, natural skin tone. Each application requires 2 photos submitted per person. If you normally have a beard, then wear on in the photo. If not, don’t worry about it. Dark clothing is required to give your shoulders and head a stark contrast from the plain white background. Also, avoid military or law enforcement uniforms if possible for security reasons. A Hijab may be worn only if it doesn’t cover the face. Other headwear such as hats, hair pieces and flashy jewelry are not permitted. Eyes must be directed toward the camera and visible. Glasses can be worn only if they do not block the eyes. Think rims, glare or tinted lenses are unacceptable. No sunglasses. Keep a neutral expression at all times. Mouth should be closed and not smiling. Make sure the image is in focus and not blurred. Shadows are not permitted and could cause a rejection of your photos. Keep hair off face. Double check your lighting. An overexposed or underexposed picture will not be accepted. Also, if a flash is used, make sure the background doesn’t reflect the light. No alterations of the image are tolerated. If you have a mole, scar or freckles, the image must show them in the final print. Red eye cannot be fixed on the computer. A retake is a must. Print photos on high quality photo paper. No objects such as bottles, toys, car seats or even pacifiers can be visible. If you feel inclined to hold your child while the picture is taken, your hands must be hidden from view. Use a plain white cloth to camouflage anything in the background. The infant must have their eyes open, mouth closed and be facing the camera. His or her head should fill 50-60% of the entire photograph. The top of the infant’s shoulders need to be included. Differing costs and differing locations can be the final straw as to where and how you receive a passport or visa photo. Your options are seemingly endless as the Internet provides many choices. Should you be inclined to stay with a trusted old tradition, you can make your way through the city and stop at your nearby drug store or post office. The cost of choosing this route can be around 60 MYR per set of photos. By going with a convenient and trusted site such as MyPassportPhotos.com, you will spend 25.50 MYR per set. Sounds like a much better deal for your money and time. What could be more convenient and stress free than having a site like MyPassportPhotos.com take care of your needs? How about being able to take all your photos from a tablet or smartphone in the comfort of your own home? This sounds like a slice of cake to us. Our passport photo booth allows you to take as many pictures needed until you are happy with the outcome. We take care of all the details and guarantee 100% government compliance and acceptance with your application. Our simple and easy to use website gives you maximum freedom to complete the tasks quicker and without worry. Should you find yourself with questions or concerns, our friendly staff are waiting 24/7. There is no need to look anywhere else. Give us a chance to get you on vacation faster than you can say bon voyage!